Silicosis is a potentially dangerous but preventable occupational lung infection caused by inhaling respirable particles containing crystalline silicon dioxide (silica). Quartz, a form of crystalline silica, is the second-most plentiful mineral inside the earth’s crust. 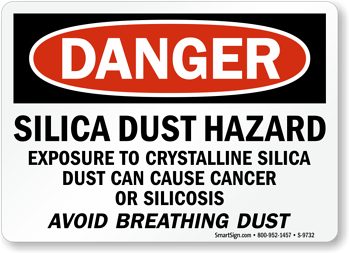 Respirable silica dust can enter the lungs and cause the formation of scar tissue, thus reducing the lungs’ ability to take in oxygen. There is no cure for silicosis. Since silicosis affects lung function, it makes one more susceptible to lung infections like tuberculosis. In addition, smoking causes lung damage and adds to the damage caused by breathing silica dust. Employees across a broad range of jobs and companies are confronted with it when they chip, cut drill or grind objects that contain crystalline silica. However, the most severe exposures to crystalline silica result from abrasive blasting, which is done to clean and smooth irregularities from molds, jewelry, and foundry castings, finish tombstones, etch or frost glass, or remove paint, oils, rust, or dirt form objects needing to be repainted or treated. Other exposures occur in cement and brick manufacturing, asphalt pavement manufacturing, china and ceramic manufacturing and the tool and die, steel and foundry industries. Crystalline silica is also used in manufacturing, household abrasives, adhesives, paints, soaps, and glass. Silicosis is classified into three types: Chronic/classic, Accelerated, and Acute. Details on each type follow. Chronic/classic silicosis. The most common, occurs after 15–20 years of moderate to low exposures to respirable crystalline silica. Symptoms associated with chronic silicosis may not be obvious; therefore, workers need to have a chest x-ray to determine if there is lung damage. As the disease progresses, the worker may experience shortness of breath upon exercising and have clinical signs of poor oxygen/carbon dioxide exchange. In later stages, the worker may experience fatigue, extreme shortness of breath, chest pain, or respiratory failure. Accelerated silicosis. This type can occur after 5-10 years of high exposures to respirable crystalline silica. Symptoms include severe shortness of breath, weakness, and weight loss. The onset of symptoms takes longer than in acute silicosis. Acute silicosis. This type occurs after a few months or as long as 2 years following exposures to extremely high concentrations of respirable crystalline silica. Symptoms of acute silicosis include severe disabling shortness of breath, weakness, and weight loss, which often leads to death. What can you do to protect against exposures to crystalline silica? OSHA has the following suggestions. Wear only a N95 NIOSH certified respirator, if respirator protection is required.